The islands, atolls and waters of the Northwestern Hawaiian Islands are an integral part of Native Hawaiian life and tradition. The islands were frequented by voyagers, and many stories recount huakaʻi, or travels, over the 1,200 miles of ocean surrounding the islands. For the Native Hawaiian community, this area is a deeply spiritual location; it is considered an ʻāina akua, or spiritual realm. The place in the sky where the sun traveled each year was the realm of Ao, the world of light and the living. Its northern boundary was Ke Ala Polohiwa a Kāne, the dark shining path of Kāne (the Tropic of Cancer), which is a metaphor for the pathway to the afterlife. Midway lies in the realm of Pō—the place of gods and spirits and primordial darkness. Here all life is born and here all life returns after death. Polynesian Voyaging Canoe, Hōkūleʻa arriving to the island of Nihoa during the 2004 voyage. Hawaiian voyagers visited Midway and the other islands of Papahānaumokuākea continuously for many centuries. Midway is known as Kuaihelani, “the backbone of heaven.” It is a homeland of the gods who migrate to and from the main Hawaiian Islands. Lagoons like the one at Midway reflect their color in the clouds above, and the stories of Kuaihelani describe it as a mythical floating island in the sky. Midway is also called Pihemanu, a newer name that tells of the loud din of the birds that live there. More than 6,000 years ago, seafarers left the islands of Southeast Asia and traveled east into the Pacific Ocean, stopping on scattered islands along the way. These ancient voyagers traveled thousands of miles without sextants or compasses. They used stars, clouds, swells, the rhythms of the ocean, and other natural signs from the environment. They passed on their knowledge of navigation from one generation to another. By 1200 BC, Pacific voyagers had reached the islands of Tonga and Sāmoa in the mid-Pacific, an area now known as western Polynesia. By about 1000 AD, they had explored and populated a 10-million-square-mile area of the Pacific bounded by the points of the Polynesian Triangle: Hawai‘i in the north, tiny Rapa Nui, or Easter Island, in the southeast, and the islands of Aotearoa, or New Zealand, in the southwest. Stories have also linked their travels to Asia, North America, and South America. It was one of the greatest human migrations ever undertaken. Hawaiians handed down their knowledge of wayfinding from one generation to the next through chants, songs, and stories. They also handed down a natural ease with the open sea, which is often described as connecting the people of these islands. Navigators voyages are based on a lifetime of studying motion and the rising and setting of specific stars. They studied the weather, the activities of seabirds, the directions of swells on the ocean, and the colors of the sea and sky. After the peoples’ first arrival in Hawaiʻi, voyaging continued between Hawaiʻi and Tahiti for several centuries. Many migrations and stories of voyaging chiefs are still well known today. Long-distance voyaging continued in Hawai’i until around the 1400s, when for unknown reasons it stopped. Traditional navigation and shorter voyages continued on a smaller scale in the Northwest Hawaiian Islands. During the 1800s and early 1900s, colonization by Western societies greatly reduced the value of traditional knowledge. Traditional navigation and voyaging became lost. 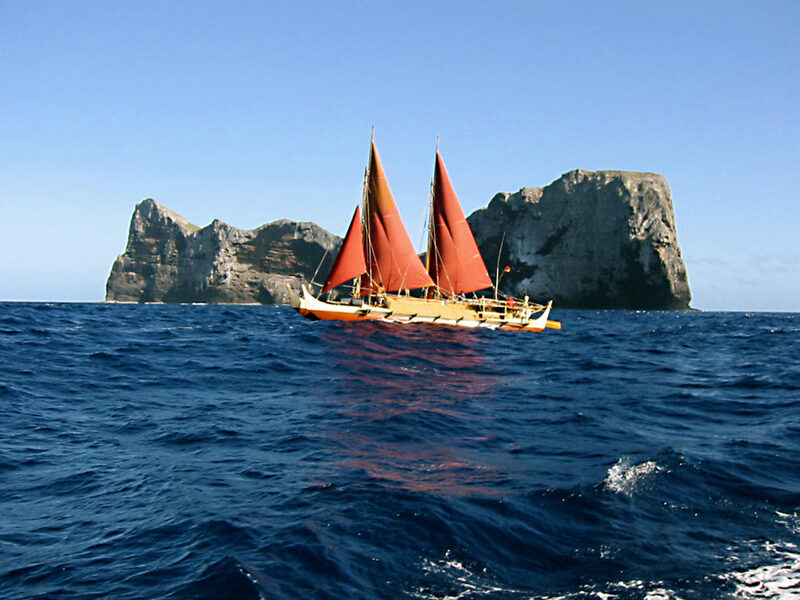 In the 1970s, a group of Native Hawaiians built a 62-foot double-hulled sailing canoe named Hōkūle’a, or “star of gladness,” with the goal of sailing from Hawaiʻi to Tahiti. The trip would be similar to the voyages their ancestors had sailed. Since there were no longer any Hawaiian navigators, the canoe was navigated by Satawalese master navigator Pius Mau Piailug. 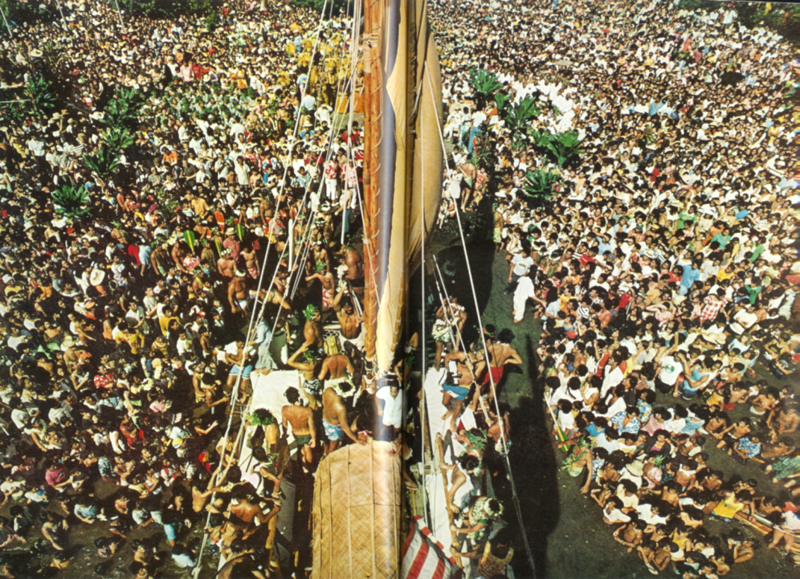 The Hōkūle’a successfully traveled from Hawaiʻi to Tahiti in 1976. On their arrival, the crew was greeted by over 17,000 people. This famous trip helped create a revival of traditional voyaging arts. There are now over 15 voyaging canoes across Polynesia that can make long-distance trips. The knowledge of navigation continues to grow in Hawaiʻi. Experienced navigators teach the next generation of voyagers the skills they have learned to help grow the tradition. Young navigators sail the Northwest Hawaiian Islands as a test of their skills. The NWHI are ideal for such tests because of the short distance to them from the main Hawaiian islands, their small size, and the lack of light pollution on the voyage. The Polynesian Voyaging Society and schools throughout Hawai‘i and the Pacific are also giving students a glimpse of the ingenuity of their ancestors. They are teaching traditional voyaging techniques in a backdrop of contemporary science. 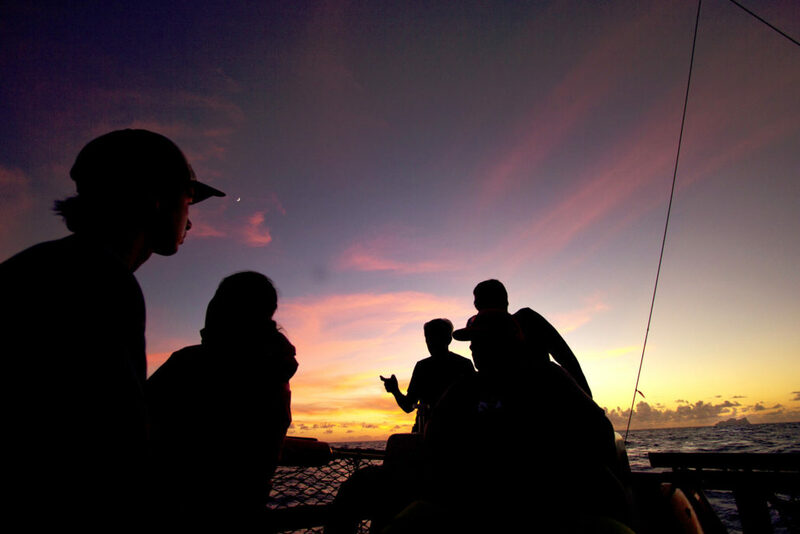 Learn about how the Polynesian Voyaging Society is cultivating the next generation of navigators. Or learn more about voyaging traditions.